Try clearing the sunroof drains. They are tubes that are in each corner of the roof cutout. Not sure if this will help, we had a 2004 Pontiac Grand Prix. Under the hood there was a seal to block the rain water from pouring into the HVAC air intake plenum. This weather seal came off and allowed water to run in on top of the cabin air filter and started corroding the fresh air / recirculate door motor. I would check for a condition similar to this for your water leak. Typically there are drain tubes that run down the a-pillars. Most of the time these tubes are connected together in sections and there is usually a spot somewhere inside the a-pillar where one or both of them have disconnected. So you have water running down your pillars behind the plastic trim and it is making its way onto the floor. You just need to find where the disconnection has occurred and reconnect it. There is also a chance that the drains in the corner of the sunroof enclosure have becomes clogged. But typically if this is the case you would have water seeping through your headliner somewhere. 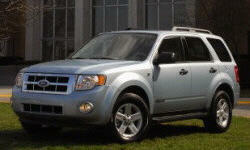 I have a 2006 Escape. This happened to me only once. Water only appeared on the floor, nowhere else, so I assumed that it was NOT running down from the overhead (Moonroof, with which my Escape is equipped). I noticed that the weather stripping around the rear doors was loose / not in position. I could see dirt on the cabin side of the T-strip. So, I re-seating the molding and it never happened again. Look for tell-take road dirt above the rocker panels. If you have it there, then water is coming up underneath the door's molding. I just wanted to tell that person with the water inside the car what I had to do to fix that. Maybe you can tell him: the car is designed so that water comes in the doors on the outside (at edge of windows) when it's raining heavily (or if you washed it with a hose), but it is supposed to drain out through the holes at the bottom of the door. My holes got clogged. As soon as I had someone unclog the holes by poking something into them from the bottom (and if you are younger and more limber than I, you could do that yourself, but I can't get down on the ground to do it), the problem was solved. The AC has a drain for condensate when the system is activated. Having the defrosters on engages the AC compressor to remove moisture from the cabin and that improves the ability to defrost the windows. If that drain gets plugged by ice or mold or other foreign matter the water can and will pool In the bottom of the heater housing eventually dripping into the floor area of the vehicle. Most mechanics know how to clear that drain. The cheap and easy method is to locate the drain and blast compressed air up into the drain. This will blow whatever is plugging the drain up into the heater, but will result in a lot of water rushing out and confirm the issue.